We know how fast and hectic your day can be. But if it’s time for your next oil change service, and at D & R Intensive Car Care, we will do our best to provide you with a quick and convenient oil change. We can change your oil quickly and perform a complete vehicle maintenance check, usually while you wait in our comfortable lobby. Don’t have time to wait? No problem! Just contact us ahead of time, and we will give you a ride wherever you need to go – and pick you up when your car is ready! 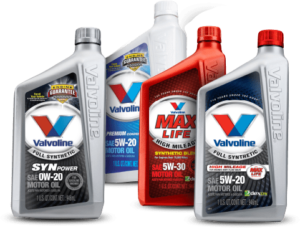 Specially formulated for the full life of the engine, Valvoline’s unique multi-viscosity formula Valvoline® Premium Synthetic Blend Motor Oil helps to. Fight the Four Major Causes of Engine Breakdown – Leaks, Deposits, Sludge, and Friction with Valvoline MaxLife® Higher Mileage Motor Oil. Valvoline SynPower® Full Synthetic Motor Oil provides your engine with the highest level of protection. * For oil changes using a typical filter and up to five (5) quarts of oil. Prices may vary on filters.